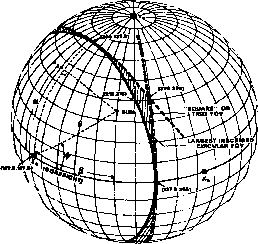 synodic period is longest for Mars and Venus (780 and 584 days), shortest for Mercury (116 days), and approaches 1 year for the other planets. 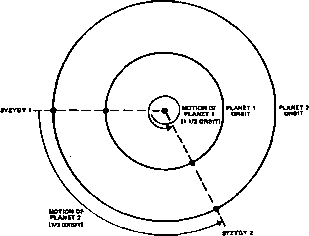 Planetary configurations are important for interplanetary flight as well as for observations because they define the opportunities for planetary travel. For example, as shown in Section 3.3, trips to Mars along a minimum energy trajectory will leave the Earth about 97 days before opposition and arrive at Mars about 162 days after opposition, although various, factors may cause the actual flight times, particularly the arrival time, to vary by several weeks. Because an opposition of Mars occurred on December 15, 1975, we would expect flights to leave Earth on about September 10, 1975, and arrive at Mars on about May 27, 1976. The two spacecraft flown during this launch opportunity, Viking I and II, were launched on August 20 and September 9, 1975, and arrived at Mars on June 19 and August 7, 1976.